As you’ll already know, Star Wars is pretty dope. Because cultural icons like this generate a galaxy’s worth of apparel to go with them, we’ve gathered the best Star Wars t-shirts to help you sort the wheat from the chaff. So to speak, anyway. These designs should suit just about anyone, no matter whether you want something subtle or bold. The only trouble is, the best Star Wars t-shirts can be pricey (we suppose it’s the downside of being a global phenomenon). Not so with our list. We’ve done our best to make sure that everything here goes for $26 or less. This makes the following tees ideal as a gift to yourself or someone else - particularly if you’re not sure what to get them for their birthday. Treat yourself, yeah? Hello, what have we here? It's a faux rock poster t-shirt for the one and only Lando Calrissian! That's right, image the cape-wearing lord of Cloud City went on a rock tour (just like the designer of this Star Wars t-shirt did)... these are the t-shirts that would have been sold at the merch stand and you can have your very own for not much money at all. You lucky thing you. Let’s not pretend like Leia isn’t one of the most badass Star Wars characters of all time and instead drool over this pop art-style Star Wars t-shirt, which pays tribute to the Princess who became a general. 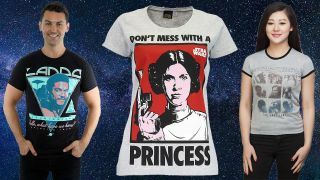 Complete with her iconic bun hairstyle and blaster - not to mention the ‘Don’t Mess With A Princess’ slogan - this Leia tee is the perfect way to celebrate one of sci-fi’s most iconic female characters. We all know Yoda is a cool dude, but if you find yourself needing to shout it from the rooftops (without actually shouting it from the rooftops) this Star Wars t-shirt will help you do it. Complete with colourful aviators and DJ headphones, the Jedi Master looks like he’s playing a festival rather than making Luke run laps around Dagobah and, frankly, we think it suits him! I find your lack of appreciation in fine art... disturbing. Well, now you can merge Van Gogh with your Star Wars fandom in this fancy tee. It's also a bit more subtle than other mash-ups, so it'll cause some fun double-takes from passers-by. However, be aware that this one's US only right now. Ah yes, another classic - the Vitruvian [insert fandom here]. This particular version throws in Boba Fett, and, as we all know, adding the bounty hunter to anything makes it 1000% cooler. It's been proven with, you know... science. Again, this is a US-exclusive. Sorry Europe. Not everyone loved Star Wars: Rogue One, but if you can’t get enough of Jyn and her band of Rebels who sacrificed everything to steal the Death Star plans, then you might want to snap up this Scarif-inspired Star Wars t-shirt. Featuring a 'Shoretrooper' from that epic beach battle in the film’s finale, you might not be able to look at it without getting a tear in your eye, but at least you’ll look good. The Stormtrooper helmet design has become synonymous with the Star Wars franchise and while there’s plenty of Star Wars t-shirts which feature the infamous henchmen, if you’re looking for something a little more colourful, this paint splatter design is for you. Mix your love for Star Wars with your love for… paint, and snap up this tee now. Are you a traditionalist at heart? Ok then, all you’re looking for is the straight, gold-coloured Star Wars logo on a t-shirt, right? Fair enough - here it is. Wear this while you’re wandering around town and just wait for everyone who passes you to start humming that iconic theme tune… Da-DA, da-da-da-DA-da, da-da-da-DA-da, da-da-da-DA! This is the perfect tee for Halloween time. Taking beloved Star Wars characters and mashing them into an October scene strewn with pumpkins and a full moon, it's adorable AND seasonal. What more could you want? Did you honestly think you were getting out of here without a Porg shirt? Think again. The adorable bird-monsters return for this awesome tee, but be aware that it's only available in the US for now. It's a little more expensive, but totally worth it. Inspired by the well-known Banksy graffiti art which featured Pulp Fiction’s Vincent Vega and Jules Winnfield holding bananas instead of guns, this t-shirt adds a Star Wars element by switching the Vincent and Jules’ faces for Darth Vader and Boba Fett’s helmets. This is one for those of you who like the Dark Side of the Force, and if you’re a fan of Pulp Fiction too - bonus! Now HERE'S a good shirt. Taking the biggest rust-bucket in the galaxy and highlighting it with a splash of primary color gives it even more cool-factor. It's classy and understated, too. You'll only get it in the US, though. Forget the critics, if you loved The Last Jedi more than any other movie in a galaxy far, far away then this is the Star Wars t-shirt for you. It's also great if you can't decide which Star Wars character you like the most as every important face from the movie gets a shout out, from Rey and Luke to Rose and the Porgs! A faded retro look helps this tee stand out from the crowd, and it's even better that the shirt immortalises one of the most memorable scenes in the series - the battle of Hoth. It's not available in the UK, unfortunately. This t-shirt is inspired by one of the most iconic moments in the franchise - the Death Star assault run. As Luke and the other X-Wing pilots attempt to fire their missiles into the Death Star’s thermal exhaust port, they use a computer targeting system which looks just like this. Although Luke ultimately ends up abandoning it in favour of the Force, it’s a cool call back to the very first Star Wars movie.